We are not a pretzel-snacking household. Some may be, especially during Superbowl festivities like this coming weekend, but in our house, we use pretzels as an ingredient to use in recipes. Lately I've used crushed pretzels in my Creamy Triple Berry Pretzel Squares and also my Chubby Hubby Cookies. However, crushed pretzels can also be used in savory applications.... like in this recipe! Sometimes I take breadcrumbs for granted and often forget I can use other ingredients to provide a tasty coating or crust on meats. I've seen cereals, potato chips, tortilla chips, even croutons processed down into crumbs and used for a crisp crust in meaty dishes. For this recipe I used pretzels. It offers a very subtle saltiness while providing a nice solid crust that won't fall apart. Using the processed pretzels as I would breadcrumbs, I coated my chicken and sauteed it until golden brown. 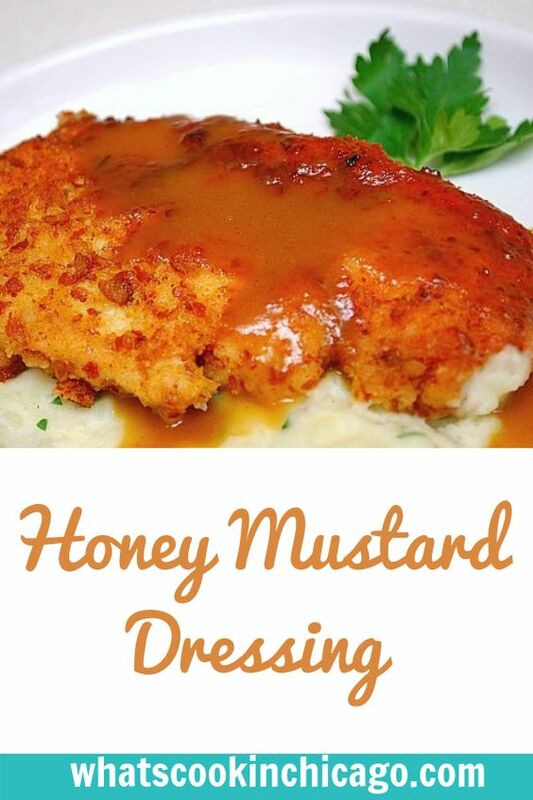 Since honey mustard is a popular condiment for soft pretzels, I made a simple honey mustard sauce to serve either on the side or over the crispy chicken. To round off the meal, I served the chicken with a leafy green side salad and creamy garlic & herb mashed potatoes. If you happen to have more pretzels than you can eat, I highly recommend processing them into crumbs and storing them in an airtight container. It will make it easy to use in future recipes, whether it's something sweet or savory! * The pretzels can actually be any hard pretzel - thin sticks, standard pretzel shapes, pretzel rods, etc. Place them in a food processor and process until you get the consistency of graham cracker crumbs. If you want more texture for your chicken coating, pulse the pretzels down to coarse crumbs instead. In a shallow dish, whisk the egg with the 1 tablespoon of water. In another shallow dish, place the flour. In a shallow dish, place the crushed/processed pretzels. Heat a skillet over medium low heat with the 1/4 olive oil. While oil is heating, season both sides of the chicken breasts with salt, pepper and garlic powder to taste. Dredge the seasoned chicken breast in flour and shake off excess. Dip the chicken breast in the egg wash and then press it into the crushed pretzels to cover all sides. When oil is hot, carefully place the crusted chicken breasts in the hot oil and fry until browned on both sides, about 5 -7 minutes, depending on the thickness of your chicken. Serve hot. Combine all ingredients in a bowl and whisk until smooth. Serve over the pretzel chicken or on the side. What a great idea for those pretzels left in the open bag in the pantry. I'm starring this in my GR. I use instant potato flakes as breading for fish, Works great. This sounds super easy, I'm definitely making it next week! We make something like this. I use honey mustard onion pretzel bits for the coating. I stick it on with a mixture of honey mustard and mayonnaise. Never thought of adding a sauce, but this sounds like a great idea. I made this today and it was absolutely amazing. I'm going to post this over at my website on Tuesday giving you full credit and kudos for the genius. Totally yummy. Wow! This looks absolutely yummy! Thanks for sharing with us this great recipe, now I have another dish to cook for dinner. I looks so go, I know it will taste even better. It might also go well with a hot cup of coffee made from my coffee maker delonghi KUDOS! This chicken recipe is very good. My whole family likes it!